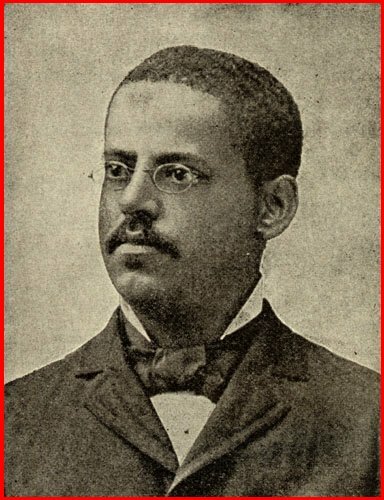 Benjamin Bradley, the black inventor that helped develop the propulsion system of the iconic Civil War steam sloop of war. The engine’s legacy today is living on as oil fueled steam engines powering most of the Wasp-class warships. The last ship of the class, USS Makin Island, was instead fitted with two General Electric LM2500 geared gas turbines. The steam sloop of war had been in existence in England before Benjamin Bradley was born, but he designed and built the engine to the first all-U.S. prototype of an advanced type while being employed at the United States Naval Academy in Annapolis, Maryland at the height of the Antebellum period. Technically still a slave, his work gained him his total freedom and a good living. Meet the ship’s legacy today, the Wasp-class ships fighting ISIS that carry existing and future Rolls Royce powered aircraft. The U.S.S. Kearsarge, a steam sloop of war, United States, and the C.S.S. 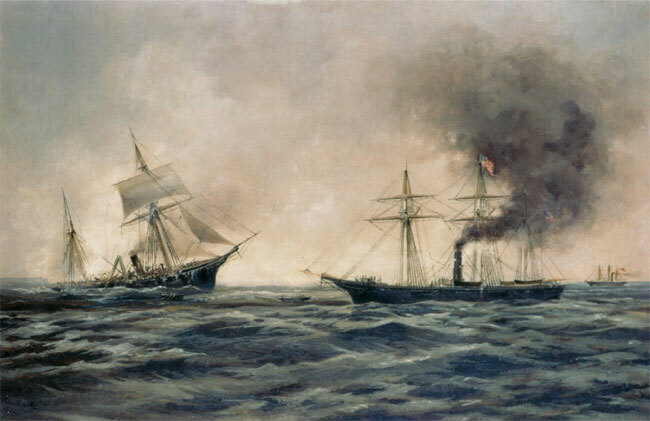 Alabama, also a steam sloop of war, Confederate States of America clashed on June 19, 1864 in the Battle of Cherbourg off the coast of France. Alabama was reduced to a sinking wreck by Kearsarge‘s more accurate gunnery and its powerful 11 in (280 mm) Dahlgren smoothbore pivot cannons. Sinking of the CSS Alabama (1922), by Xanthus Smith, Franklin D. Roosevelt Presidential Library, Hyde Park, New York. Benjamin Bradley was born a slave in Maryland, around 1830, but became an engineer and inventor. As a teenager, Bradley was put to work at an office where he built a working steam engine from pieces of scrap metal. Others were so impressed with Bradley’s mechanical skills that he was given a job as an assistant in the science department at the United States Naval Academy in Annapolis, Maryland where he set up and helped conduct experiments. Professors at the Naval Academy were very impressed with Bradley, saying he was smart, a quick learner, and did not make mistakes. Bradley was paid in full for his work, but the money he had made went to his enslaver, who allowed Bradley to keep five dollars a month for himself. Bradley had not forgotten his work with steam engines. He saved the money he earned, and sold his original model engine to a student at the Academy. Bradley then used his savings to develop and build an engine large enough to run a steam-powered warship. Because he was a slave, Bradley was not allowed to get a patent for the engine he developed. He was, however, able to sell the engine and keep the money, which he used to buy his freedom. He lived the rest of his life as a free man. The legacy of the USS Kearsarge lives on today as a steam engine powered amphibious assault ship (USS Kearsarge) fighting ISIS. Arguably the king of all conventionally powered ships in existence today (non-nuclear), the Wasp-class ships carry existing and future Rolls Royce powered aircraft. The ships are so important and expensive that they are always a floating and sub-surface battle group and not just a ship. Other ship classes are smaller and have twice the propulsion power (allowing for more speed) but no ship other than an aircraft carrier does more jobs than a Wasp-class warship. The ship looks huge in the second USS Kearsarge video below. 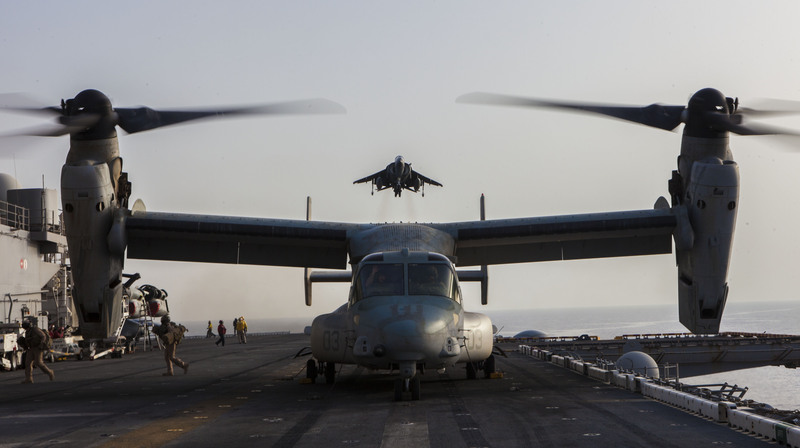 USS Kearsarge (LHD-3) is the third Wasp-class amphibious assault ship of the United States Navy. She is the fifth ship to be named (the fourth actually commissioned) in honor of USS Kearsarge, a sloop-of-war that gained fame during the American Civil War, which was in turn named for Mount Kearsarge in New Hampshire. Next → Next post: General Sherman’s sacrificed black marchers: The incident that should have ended prejudice for good.